I had a more ambitious one planned but I might not have the time to do it in. We shall see. In the meantime, here's a 6x6 Dream I just finished to accompany my 6x6 Wesley Dodds. That right there is money! Great job, Ron! Thanks guys! Glad you like them. 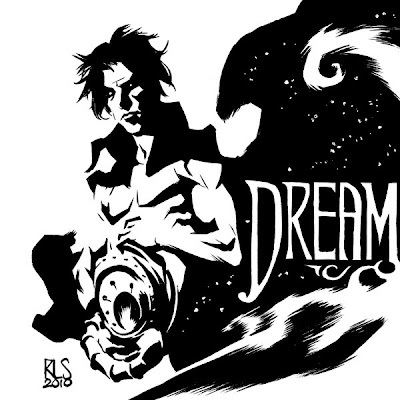 The inks on Dream are fantastic, Ron. And agreed, the angle on Wesley is great. Both of these sketches are fantastic...they are so dope they might be illegal! I know this probably sounds weird, but you would be able to make some mind-blowing pumpkin carving designs with this style. You'd just have to make sure there are no floating black pieces and have them connected to each other or via one grey tone of shading. These remind me of book plates! great job!!!! Amber - You know, that doesn't sound weird at all. That's a great idea. Now, I just have to get better at pumpkin carving. I'd like to do something like this. Dan - Thank you sir! Oh how I love your bold whites, Ever so much!